There are few greater pleasures in life than opening a bottle of wine from a great vintage and having it exceed your expectations. This is frustratingly rare: Too often, the wine media builds up a vintage so much that, by the time consumers have a chance to pop the cork on the wines they’ve been waiting for, the bottles tend to fall somehow short. But once in a while you come across a confluence of vintage, region or appellation, and producer that results in a truly memorable experience. I've found this with many of the 2005 Stags Leap District Cabernets, and the top 2005s from Bordeaux haven’t disappointed me yet, either. To this group, I’d like to add the 2007 Napa Cabernets from the best producers, including the two wines featured here today, the 2007 Mount Veeder Winery Cabernet Sauvignon and the 2007 Ehlers Estate St. Helena Cabernet Sauvignon “1886,” both of which embody exactly why consumers should seek out 2007s from Napa and fill their cellars with them. 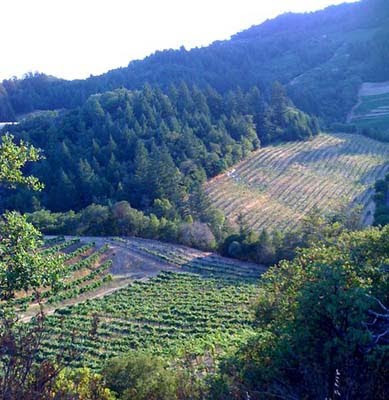 The Mount Veeder is beautiful right out of the gate, with round, ripe berry fruit on the nose limned with deep, dark currants, cedar, tobacco, and black cherry creme brulee. On the palate, it’s loaded with ripe black cherry and black and red currants, loads of blackberry, and a bit of blueberry. For all this fruit, however, it’s a rich, detailed wine, with dusty tannins, perfectly balanced acid, and a complicating hint of violets. I’d give it another two years to integrate more fully, but even now it’s got more than enough charm, power, and balance to win you over if you do open a bottle in the short-term, especially with dinner. The Ehlers Estate, on the other hand, is positively decadent right now, and smells of ripe, concentrated, and magnificently expressive crushed black raspberry, cherry compote, candied cherries, sandalwood, and caramel. All that sweet, beautiful fruit comes through on the palate, too, and is joined by chocolate caramels, grilled rosemary, toast, and acid that is 100% in harmony with the rest of the wine. This Cabernet boasts a life of 12+ years, though I’ve rarely felt tannins so superbly integrated and polished this early in their evolution. Both of these wines, for all their aging potential, are awfully difficult to resist right now.